What do you put in your Systainers. Let see your tools or accessories in your systainers. I now have all my tools in systainers. I thought it would be cool to start a thread see how everyone else uses systainers to store their tools. I know a lot of guys are using Kaizen Foam. Might be cool to get ideas and see what others are doing. Re: What do you put in your Systainers. I'll start it off. Here is my new Bosch JS572 in a Tanos Sapphire Blue Sys2 with red t-loc and black handle. Used foam that was precut from Woodcraft. I will throw a couple in on this thread! Dewalt hammerdrill and tapcons both in sys 1s. Dewalt planer and all its accessories in a sys2. The Bosch lasers(points, level and measuring laser) along with extra batteries and a Dewalt 20v charger and battery. Senco 1010 in a sys5 with room for a 25ft coil hose and a cord reel under it, and a MFT lid. Looks good. I really like the Mft top. I have my Paslode Angled 16ga in a Combi2. The drawes work great for nail, gas and charger storage. Nothing but the tools that come with them and associated accessories that fit. I dont need my tools to be mobile so I have found no need to use systainers for organization around the shop. I have a Sys 2 with a number of hand tools. I also have a Sys 1 with my DeWalt Drill and Impact in. A mate of mine gave me grief for trying to make out I had more Festool than I do but for me it's keeping them all in a system. 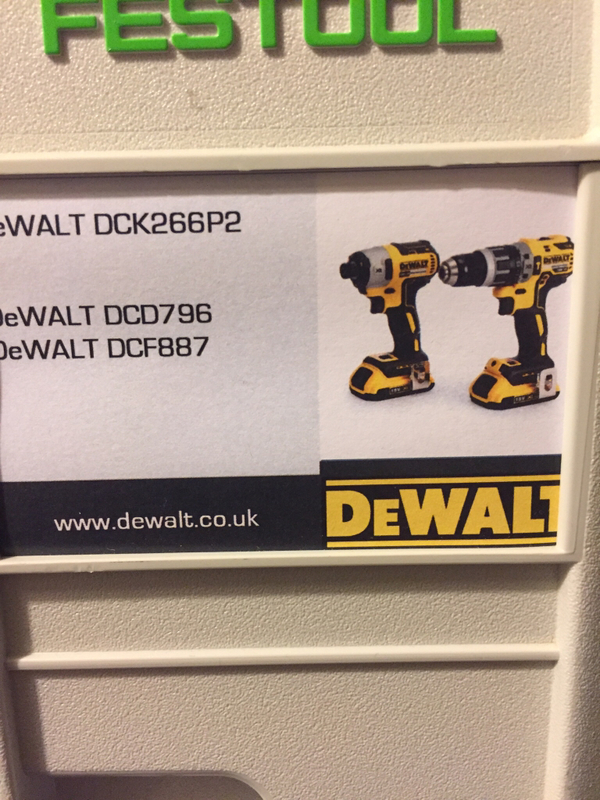 I have made a Dewalt label for it. Quick side question for you, what do you think about the dust collection on that saw? I'm seriously considering ditching my Carvex and going with the D-Handle version of the JS572. It's really good to see it fits well in a SYS1 as well! I think I bought a Sys1 for them but with all the foam they didn't quite fit so I had to do a swap about. - Lunch box, contains plastic silver ware, knife for cheese and sausage, napkins, paper plates, corkscrew, etc. - Sys 3 for safety stuff, i.e. tyvek suits, masks, gloves, safety glasses, etc. The dust collection is awesome. The dust tube is actually on a hinge and will move side to side when cutting and helps the saw move more smoothly when making curve cuts. I was going to get the Carvex but decided the Bosch JS572 was a better saw. It has a built in led light and tool less bevel. That looks great. I need to get some time and make some custom labels. Just finished up a organizer for my finish nails. I use 15, 18, 23 gauge nailers plus a narrow crown stapler on my jobs. Nice to finally get this cleaned up, but I'm probably going to get a few shallow boxes to organize the loose brads. Just got done with my cabinet systainer. Its a sys1 with compartments. I took out some of the compartents and replaced with kiazen foam for my true position hardware jig. I have done A LOT of decks over the years. I always end up with extra pieces of Azek cladding. Considering it's impervious to rot AND how expensive the stuff is, I've always hesitated to throw it away. So now I use it to create custom tool holders. It's light, it's free (well, already paid for), easy to mill, pretty tough. 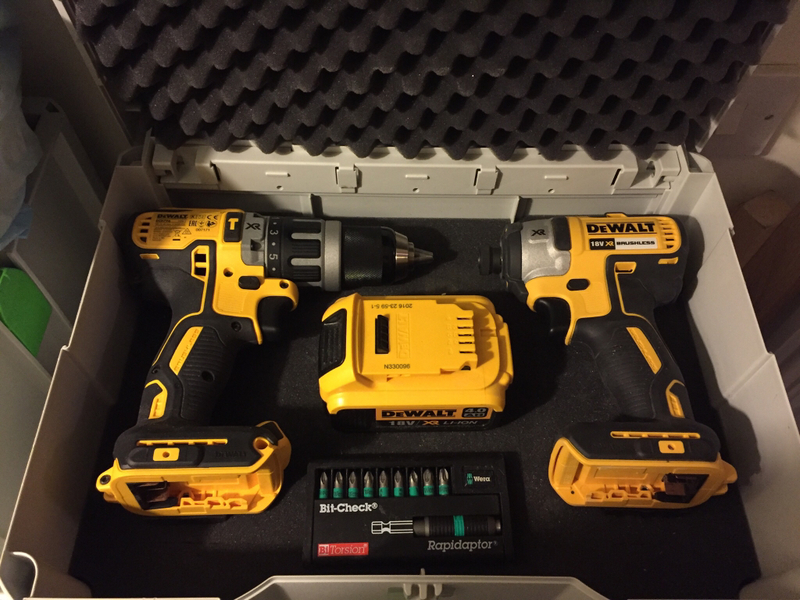 Here's a simple one for a Systainer 3 - and my DeWalt impact driver and associated items. I've actually added to this since this picture. I'll add more pictures later. That's a good idea for tool holders in systainers. I tend to think foam but a solid material works well too. I am in the process of switching over to Systainers for my tools. The Bosch boxes will be for sale soon. For inserts I purchased a foam insert from kaizeninserts.com and use this as a template to cut my own inserts from FastCap's Kaizen foam sheets. I like the fact that I can layout tools/accessories and section cut the Kaizen foam removing layers to accommodate tool shape. I anchor my lid inserts with double sided tape. Once I remove the required layers of foam I use a hot knife with a flat quarter sized tip for flatting and shaping. When scraping away layers I'll use the claw end of a small remodeling pry bar. Using fingers to claw back the foam works for large areas but the remodel bar works great for final leveling. 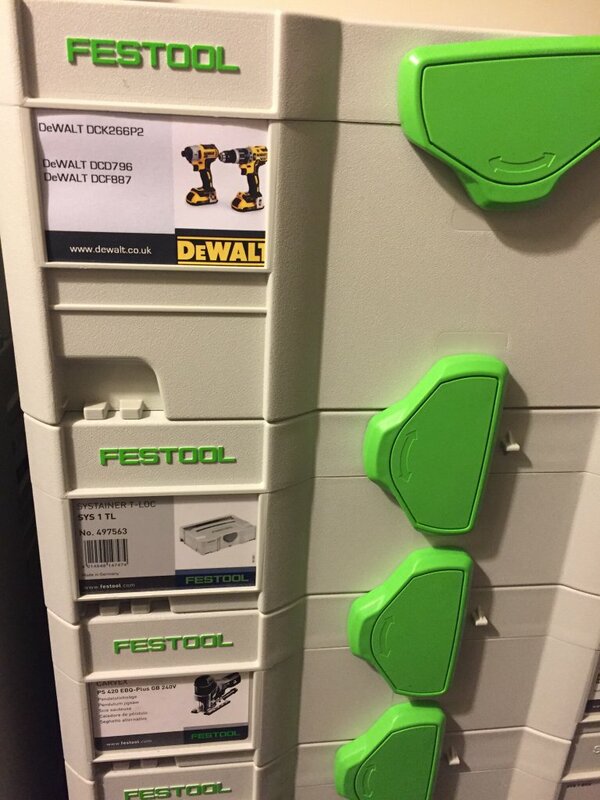 I make my custom labels for both Festool and non-Festool tools/accessories. This way I can personalize and use manufacturers logos tool images. Saving imaged from internet searching and using TechSmith's Snagit app for screen grabs and editing. I make my labels using Microsoft's Publisher app. "I own too many clamps" said no carpenter ever. I started out with L-Boxxes and a lot of Bosch Professional tools. By now I have sold off almost everything I once owned made by Bosch, just kept a small rotary hammer and a 12V GSR for kinda personal reasons. Those are also still in 2 L-Boxxes. Without elaborating any further, the L-Boxx is simply not for me. I now only use Systainers. My top priority is to fit as much accessories as possible together with the tool in a Systainer. For example, my Snap-On impact wrench Systainer. What the Systainer holds is two 3/8" metric socket sets shallow/deep. Additional battery, adapters (3/8"-1/2", 3/8"-1/4" hex, 1/2"-3/8" ...), charger, 1/2" sockets for tire changing, a 1/2" ratchet (not in the picture), 1/4" impact bits and of course the tool itself. Then there is my Festool drill/driver kit. It consists of 3 Systainers. A SYS-1 with CXS and accessories, a SYS-2 with attic-lid for my PDC and accessories (+ one ration of consumables) and another SYS-1 with the Centrotec installers kit. Then comes the DTS sander kit. It consists of one SYS-1 for sanding paper and a SYS-2 for the tool and accessories. Pictures were taken when I got the stuff - looks a little different today and there was more stuff added. Then a SYS-2 for my DWC. It's pretty basic. Tool, charger, batteries and some extra bits. Then my SYS-PH. It has an additional extension cord with built in RCD / GFI (hope that is the right translation). Currently I'm working on a concept for putting my Fein AFMM 18 QSL, and my Hilti TE 30-A36 in Systainer(s), too. I'll post pictures when I found a solution that works for me. I also use the Festool-PDF to create my own labels. I might need to take a picture of all of them together *lol*. Can anyone verify whether the mini fits inside the new sortainer drawers (4/sort3 and combis)? Per specs it seems it should be a perfect fit. They will not. Too tall. Maybe mine is an atypical use, but besides being an avid user of Festools and Systainers I also am a long range target shooter and reloader. Because I'm on an extended assignment in northern Nevada I found myself assembling a collection of tools to reload my ammunition while I'm away from home (hand loaded ammunition is typically more accurate than factory loaded). Yes, I could have dumped everything into a plastic bin, but the Sys-Combi3 turns out to be the perfect solution. Besides powder and primers there's room from a small press in the top compartment along with a digital scale and loading block. In the drawer I store dies, funnel, digital calipers, and assorted parts. Now I can simply pull out my Systainer and sit at the kitchen table with all the equipment needed to reload and when I'm done put it all away in a neat and organized fashion. Remember that the only scientist to walk on the moon was a geologist. Dr. Harrison Schmitt - Apollo 17 - Valley of Taurus-Littrow - 11 to 17 December 1972. That's definitely a great idea @dwillis ! To keep this thread alive, fresh picture from today of my Snap-On impact wrench SYS 2 - I re-adjusted some of the roofing panels on my patio.